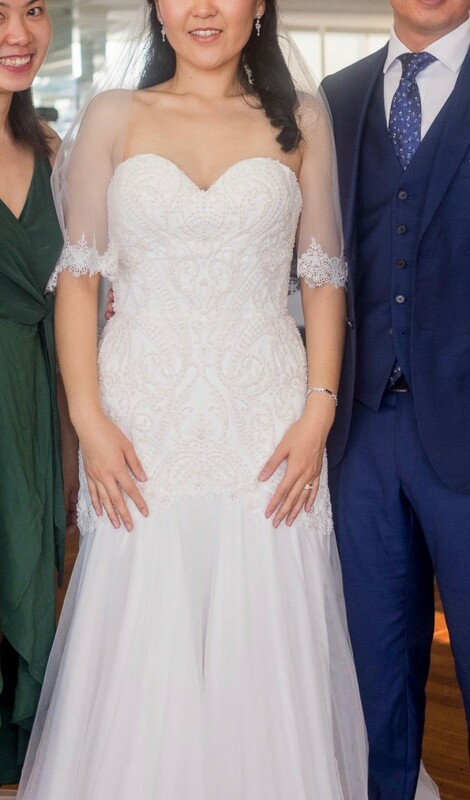 I wore this beautiful Jack Sullivan dress with pearl details on my wedding, I felt absolutely beautiful wearing it. The price includes the cathedral veil with lace details. The dress was retailing for $2800, and the veil was $500. Dry-cleaned (with receipt) the dress the next day, good as new, no damage. I am true size (AU) 10, the bust of the dress would fit cup D, waist is 68-72cm. I did not alter the dress. I am bra size 10C (I wore adhesive paddings inside), 165cm tall, and wore 11cm heels. I love the pearl details on the bodice, and the finished completely white look of the dress, very glamorous and elegant. Serious buyers welcome to try-on in Meadowbank NSW. Once you send a message, Dari can invite you to purchase the dress.